Among the many vintage handbags we have collected and cared for over the years, vintage leather bags raise particular questions - Can I get this leather wet? Do I need to clean it? How do I store it? And of all the many types of vintage leather handbags, Coach bags have more particular instructions than most. That's because vintage Coach bags are made of tanned leather that is otherwise unfinished. This lack of treatment gives them an entirely unique, natural feel but it also leaves Coach leather open to blemishes and burnishing, sometimes considered "good patina" on a vintage design. At Vintage Vixen our usual answer about how to care for vintage leather is simple - First, clean it lightly and sparingly with saddle soap. Second, and only if needed, moisturize it with a good quality leather conditioner. In both steps, test the cleaning agent first in an inconspicuous area, let it dry and assess any change. By the way, we do not use products like neat's foot oil. Saddle soap is easily obtained at a local drug store, and you can find museum quality leather conditioner online at places like Preservation Solutions. We have used this company to restore potentially unsaleable leathers with beautiful results... some of them seen on movie sets after their reconditioning here. But I digress... 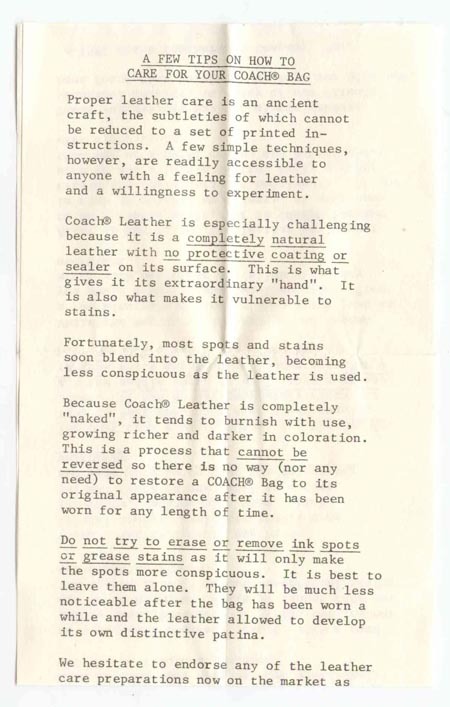 The Coach Leatherware instructions below will illuminate handbag collectors as to what Coach itself recommends for cleaning their unaltered natural leathers. 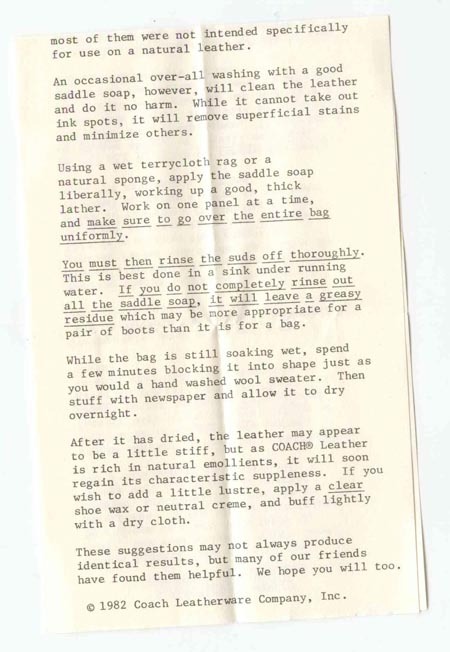 It's interesting to see that they actually recommend rinsing off saddle soap under running water, to the point that the leather is "soaking wet". I have not attempted this, so I cannot say if a vintage Coach bag will like this kind of treatment. If you know, enlighten us with a comment! We would love to hear from you. As you plan how to care for your vintage leather bags, remember that leather is a skin, and it "breathes" (expands and contracts) with its surrounding environment. Just like you protect your skin with shade and clothing, we always suggest protecting vintage leather purses from the elements - whether it's rain outside or dust in the closet. 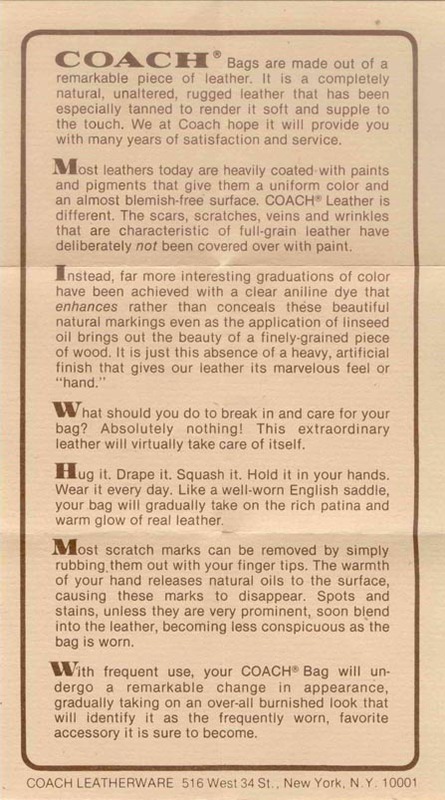 It might seem obvious, but leather care (and especially care of vintage handbags) is a love of ours, so we were excited to share this tidbit from the Coach Leatherware company. Until next time, Vixens! There should be no problem with getting your Coach handbag wet while cleaning, I have personally Soaked Coach handbags that had water stains to remove them. Hi Daniel, interesting to hear. Have you immersed the bag in water? Or just lathered it to the point of "dripping wet"? I have not tried immersion... yet! Nice to find this interesting post. I have a vintage coach backpack. The leather seems to be almost cracking a bit. Do you advise against using a leather lotion? I know it sounds scary, Yes you can totally immerse the vintage coach bag block and shape it then let it dry. I have done it several times with good results. I always do this to a bag as a last resort. it has never failed me. Time consuming as it may take a week to completely dry. I use Lexol leather cleaner to soak bags and soak several of the same color at a time in a bin where the bag is totally covered with water. Then Stuff them with bubble wrap until I acheive the desired shape and let them dry. after completely dry we touch them up with the correct color, polish the metal findings and the bags Look New. There will be some swelling of the creed patch that will make it not as ledgible, that is the only drawback I have seen. These older Coach bags are so well made you can still get years of wear out of them. I have never tried this method on a fabric lined bag. The vintage 1980s leather can certainly hold up to a soaking. I had a vintage Coach briefcase decades ago and a yellow hi-lighter cap came off & leaked all over the front of my beautiful tan briefcase - as you can imagine I was freaked out. I called Coach and they told me to soak the bag in Ivory dish soap and then stuff and block it, let it air dry slowly. All of the hi-lighter stain came out. I don't recall exactly how long it took but as the bag dried the color came back to the original hue. I don't recall if they told me to use any kind of conditioner afterwards (this was back in the 1980's). I still have the briefcase. I work from home these days so I don't use it that often, but I used it daily for well over a decade, and it still looks amazing. The leather only gets better with age. I was trying to figure out what type of conditioner I could use on a vintage purse that's been stored in my closet for way too long and was glad to see a leather cream would work. I was worried about using something that could rub off on my clothes. Thanks for the info. I have great results using Bicks on less dry leather. For others, I use Leather CPR (can order online thru Walmart.com at a great price, free shipping, to your mailbox!). There is a leather conditioner called Black Rocks that can help bring back some sheen BUT it may discolor lighter colored leathers to important to test. Lexol Cleaner and Conditioners come recommended, too. Subsequently, Drew Barrymore Face Cream on the off chance that a young lady is truly enthusiastic about improving her looks, at that point she could tremendously overhaul it by following the right beauty tips.